Bexhill United Football Club’s scheduled match away to Lingfield today (Saturday) has been postponed. The Macron Store Southern Combination League Division One third versus fifth fixture has been called-off after the pitch failed an 11am inspection. With Bexhill’s game at Billingshurst last weekend also called-off and the Pirates not having a fixture next weekend, they look set to go into their Division One Challenge Cup semi-final against Oakwood on Wednesday March 28 not having played a competitive match for 25 days. Hastings United’s match at home to Walton Casuals in Bostik League Division One South is still going ahead, however. Snow has been falling at a bitterly cold Pilot Field this morning, but so far hasn’t been settling. Kick-off is 3pm. Westfield’s game at home to Roffey in Southern Combination League Division Two is also on. Third-placed Westfield will move above their second-placed opponents with a victory in a match which will kick-off at 3pm. 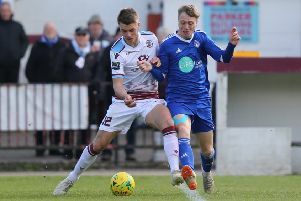 Only three Macron East Sussex Football League fixtures are set to beat the weather, although seven cup ties involving clubs from the league are on as things stand. Check the league website for full details.